Establishing a specific date and linking it to an end-of-the world scenario appears to be the work of sensationalist hucksters and New Age mystics who have used the world's greatest rumor mill — the Internet — to create unjustified hysteria. In the next installment of this 2012 series, we'll look to see what the Bible says concerning the end of this world. 14. G. Jeffrey MacDonald, "Does Maya Calendar predict 2012 apocalypse?" USA Today, March 27, 2007, www.usatoday.com/tech/science/2007-03-27-maya-2012_n.htm, accessed October 18, 2009. 15. Mervin Stoddart, "Will the world end in 2012?" The Jamaica Observer, October 25, 2008, www.jamaicaobserver.com, accessed on October 6, 2009. 16. Jean Meeus, Mathematical Astronomy Morsels, (Richmond, VA: Willmann-Bell Publishers, 1997). 17. Richard Lowe, "2012: What's All The Fuss About?" www.december212012.com, accessed October 18, 2009. 18. 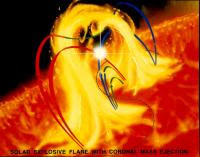 Alfred Lambremont Webre, "2012 may bring 'perfect storm' — solar flares, systems collapse," Fort Worth Examiner, April 1, 2009, www.examiner.com, accessed October 18, 2009. 19. NASA, "Solar Storm Warning," March 10, 2006, http://science.nasa.gov/headlines/y2006/10mar_stormwarning.htm. 20. For more information about Nostradamus, see "Nostradamus Prophet or Charlatan?" by Dr. David R. Reagan, www.lamblion.com/articles/articles_cults9.php. 21. David R. Reagan, "The Bible Code: Is it for real, and if so, does it provide new evidence of the supernatural origin of the Bible?" www.lamblion.com/articles/articles_bible4.php. 22. Drosnin, The Bible Code, pp. 123-127, 153.